Don’t just go with a bland poured concrete driveway. Shake things up a bit! There are so many options for poured concrete these days that you would be doing yourself a disservice by not investigating the myriad of different looks you can get with readily available additives, materials and techniques. Think of your driveway as a huge, blank canvas just waiting for a little bit of an artistic touch to help transform your house into a home. Here’s a great idea that I picked up from the English cottage that I frequented last year…(r u ready) a sealed, washed river pebble-embedded poured concrete driveway. It turned out beautifully so have a look. Last year when I was making regular visits to the cottage, something new and/or different was always waiting for me. Yes…it was under construction at the time, but what I mean is that I would find something that I hadn’t seen at any other home that I had visited in the past each and every visit. 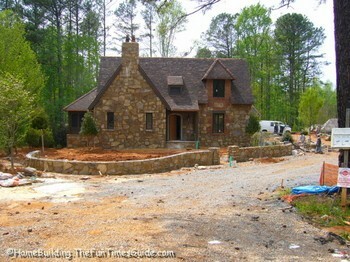 It was truly a custom home built for and by one of the nation’s premiere custom homebuilders, Bonner Custom Homes. Survey and grade appropriately for proper drainage. Pour the concrete and smooth it. Carefully pour and evenly spread the washed river pebbles across the wet concrete. Let the concrete cure for a day. Spray the concrete with sealant. Cut the expansion joints into the concrete while it is still “green”. Obviously, the timing of spreading the river pebbles is crucial. The concrete has to be set just a bit but not too much. This will allow the pebbles to embed into the wet concrete without sinking below the surface. I’ll find out the details on that soon and update. The result is an attractive, colorful and natural looking concrete driveway. It blends in perfectly with the exterior decor of the home and gives it that custom look. This a great idea that you can apply to sidewalks and patios, too!